Research confirms that leaders who practice constructive conflict management are not only considered to be more effective in general, but they’re also rated by their bosses as better candidates for promotion. At the same time, most leaders generally try to avoid conflict since it can be emotionally draining and because they’re not particularly skilled at managing it. As a consequence, leaders often miss out on opportunities presented by conflict and instead experience only its downsides. The Leadership Development Institute (LDI) is excited to announce a new offering that can help leaders become more effective in their management of conflict. Conflict Coaching provides leaders with the opportunity to complete LDI’s Conflict Dynamics Profile® (CDP) assessment instrument and to obtain ongoing coaching to increase their effectiveness in responding to workplace conflict. which behaviors would have the most severely negative impact within the individual’s particular organization. After the CDP assessment is completed, one of LDI’s experienced executive coaches will provide the individual with a two-hour individual feedback session to help clarify the CDP results and develop a personal action plan. The coach and participant will then schedule three coaching sessions over the coming months; the role of the coach is to provide support, accountability and expertise as the participant works to develop the specific skills and behaviors that are keys to handling conflict more effectively. The cost for Conflict Coaching is $2,175 and includes the administration of the CDP instrument, a two-hour individualized feedback session, and three subsequent one- hour coaching sessions. Additional one-hour coaching sessions are available for $400. If you are interested in registering for or just finding out more about LDI’s Conflict Coaching service, please call 800-753-0444 and ask for Megan Watson Kramer. 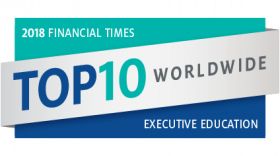 For the 17th year in a row, the Financial Times ranks CCL as one of the world’s Top 10 executive education providers in the 2018 survey of executive education! CCL remains the only institution among 85 in the survey focused exclusively on leadership development.